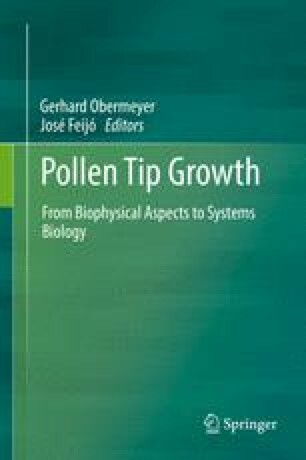 Pollen, an extremely reduced bi-cellular or tri-cellular male reproductive structure of flowering plants, serves as a model for numerous studies covering a wide range of developmental and physiological processes. The pollen development and subsequent progamic phase represent two fragile and vital phases of plant ontogenesis, and pollen was among the first singular plant tissues thoroughly characterised at the transcriptomic level. Here we present an overview of high-throughput tools applied in pollen research on numerous plant species. Transcriptomics, being the first experimental approach used, has provided and continues providing valuable information about global and specific gene expression and its dynamics. However, the proteome does not fully reflect the transcriptome, namely, because post-transcriptional regulatory levels, especially translation, mRNA storage and protein modifications, are active during male gametophyte development and during progamic phase. Transcriptomics therefore should be complemented by other -omic tools to get more realistic insight, most importantly proteomics and other specialised approaches mapping the involvement of regulatory RNAs and protein post-translational modifications as well as experiments designed to identify the subsets of total -omes like translatome, secretome or allergome. Jan Fíla and Lenka Záveská Drábková contributed equally to this work. The authors gratefully acknowledge the financial support from the Czech Science Foundation (grants no. 15–16050S and 17-23183S).